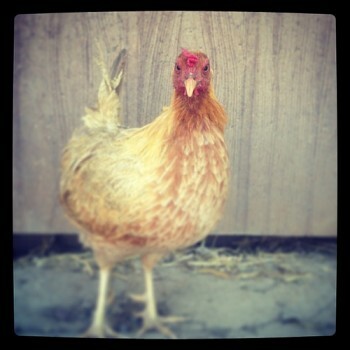 Harvest Home Animal Sanctuary is pleased to introduce you to Chloe the Ex-Cockfighting Breeder Hen. She found sanctuary at our rescue facility in Stockton, after a cockfighting raid in Tulare County June 12, 2012. The raid, conducted by HSUS and the Tulare County Sheriff’s Department resulted in the arrest of two suspected cockfighters, the seizure of the largest number of cockfighting knives in US history, and the seizure of 388 hens and roosters. We are so thankful to be able to open our doors to Chloe, 4 other ex-cockfighting breeder hens, and a single chick – at Harvest Home, they will live out the rest of their lives in peace and friendship with other animals. This historic raid reminds us of the importance of helping animals in need every day. This photograph was taken moments after Chloe arrived at Harvest Home Sanctuary. Watch the Fox40 TV news story about Chloe and her companions’ arrival at Harvest Home, and the record-setting cockfighting knife seizure in Tulare County.